This is the closest venue to fish for most of the SWFF members. 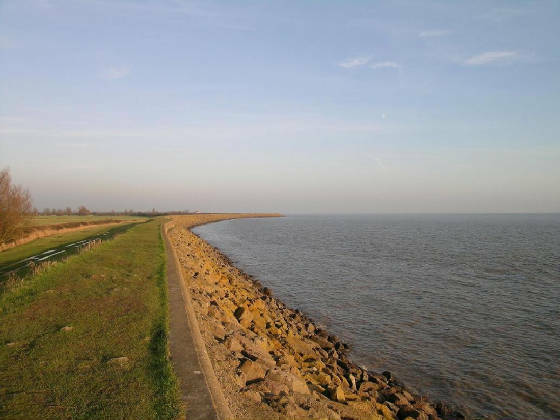 A high or low tide venue, Goldcliff comprises of a large sea wall dropping off to mud, silt and some small rocky patches mainly close to the sea wall. Fishing off the wall itself makes Goldcliff a comfortable place to fish, the turf covered wall top is level and makes it perfect for umbrellas/storm shelters in bad weather. Parking is limited and take care not to obstruct any of the gates or driveways of the local residents. The left hand point is a fair old walk but gives easier access to the deeper water, holding bottom on the point may be a problem on bigger tides. Be careful not to allow your lead to drift towards the salmon posts situated on the point as snags are common. The bay area itself seems to be less productive than either of the points; you'll need to be a big caster to hit the deeper water. One plus point of the bay however is that the tidal rip isn't as strong as it is on the points. Also the chances of loosing tackle here are minimal. As with all areas of Goldcliff watch when climbing down the wall as it can be very slippery. Expect to catch whiting and codling in winter with some rays, sole and big conger in summer. Good baits include rag, mackerel and squid.